179 cards. Print runs for all cards not available. 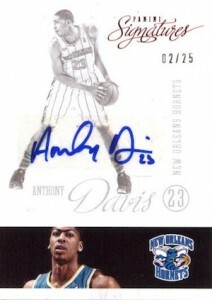 Autographs are nothing new in the hobby, but 2012-13 Panini Signatures Basketball pushes the boundaries of the presentation. Just as the name suggests, the focus of the high-end release is on signed cards. But that's the same as plenty of other sets. 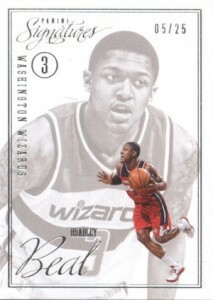 What sets 2012-13 Panini Signatures Basketball apart is how the cards look. Many parts of the product, inserts and autographs, use a lot of white space. Large images are done in a somewhat muted grayscale, further adding to the light look. What this does is help the colors that do appear, either the signature or a ribbon photo, pop on the card. The inserts and some of the autographs take similar approaches in this regard. The 2012-13 Panini Signatures Basketball does not have a base set exactly, but the Chase Rookies, Chase Stars and Chase Legends inserts take a similar approach --sort of. A total of 15 players from the double-rookie class are featured in the Chase Rookies set. Each player has ten different photo variations, making for 150 different cards. All are numbered to 25. The Chase Stars and Chase Legends are also heavy on variations. Like the rookies, they're also limited to 25 numbered copies. But what about the autographs? They combine to fall three per four-card box. Signatures has a total of 200 cards. There are 150 cards in the Die-Cut Signatures set. Current players and retired stars are included. 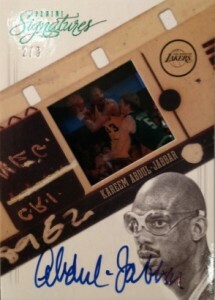 The most distinct part of 2012-13 Panini Signatures Basketball is the Signatures Film set. These autograph cards have a film slide embedded in them. The checklist is a big 200 cards. 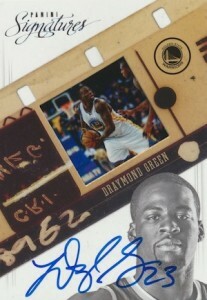 Good: Lots of autographs, Signatures Film cards look fantastic, set construction ensures low numbered cards in every box. 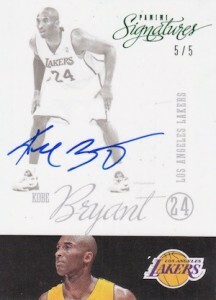 Bad: Too many variations, parallels don't add excitement, white design does not work well for sticker autographs. The Bottom Line: 2012-13 Panini Signatures Basketball lives up to its name by offering three autographs in every single-pack box. The construction of several variations for non-autographed allows for lots of low-numbered cards as well as a focus on only key players. Unfortunately that doesn't carry over to the autograph checklists. Like a lot of sets this year, there are lots of stars but also plenty of low-impact players. 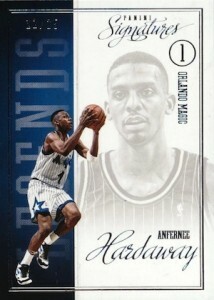 The overall look and feel is different from anything Panini's offered. It's such a departure that some will like it a lot while others will likely shun it. Personally, I think it's sharp and works well with autographs (at least when they're on-card). 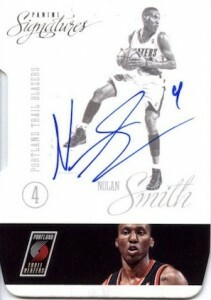 Most of the cards in 2012-13 Panini Signatures Basketball look simple, though not in the plain sense. The designs emphasize lots of white, which works well as an autograph canvas. At least when they're signed on-card. Those that use stickers, though, are not nearly as attractive -- and not just because they're stickers. The design looks as though it was intended for hard signatures. Those that don't have them look simply as though the sticker was placed over top and not incorporated into the design at all. The small action stripes that have the color photo are an interesting aspect. It's different and works in a sense, but not something I'd like to see a lot of. Keep it isolated and not a trend and I'm good. 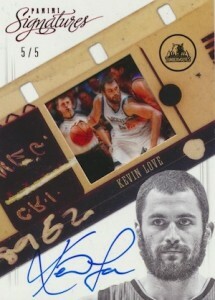 By far, my favourite cards in 2012-13 Panini Signatures Basketball are the Signatures Film cards. 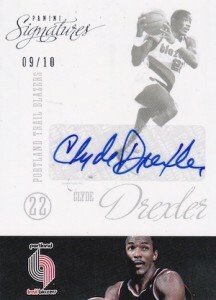 The embedded film and on-card autograph make them stand out. But it's the integration of the film strip into the design that really makes them pop for me. The choice to go with few players but lots of variations on the base, I mean Chase cards, is an interesting one. Basically, it's a toned down version of the Topps Tek model where all are more or less the same but one element. If you want one card of a particular player, it works. But it's the variations that make up the chase. Topps Tek went over-the-top with both its designs and variations. In Panini Signatures, the different variations are subtle. This is amplified by the amount of white space. But it's a great way to ensure this part of the set is filled with only top players. 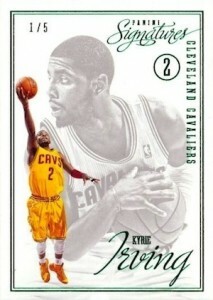 Like the design, this isn't something I want to see a lot of, but it could fill a niche for player collectors. As for the autographs, which should be the central focus of any set named Signatures, the number of signers is daunting. Like any deep checklist, there's going to be several big names. And lots of lesser players. So if you're buying a box, don't expect superstars every time. When everything is rare, nothing is rare. That's the case with 2012-13 Panini Signatures Basketball. While I'm sure it has a somewhat limited print run, until it dries up, I doubt that a lot of the Chase cards will carry much of a premium despite all being numbered to 25 or less. On the surface, it sounds like a great idea. The allure of guaranteed rare cards is exciting. But then again, everyone who busts the product is getting a similar guarantee. 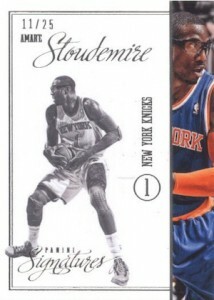 That said, if this approach is going to be taken, I'm glad Panini kept the number of names in the Chase sets low. As for the autographs, it's a tough sell with the sheer number of lesser players. And, again, it's a matter of everything being rare working against it in a sense. Perhaps cutting the number of autographs down to two but putting the same amount of resources into the autograph checklist would help. Cut the number of less desirable players and focus that money on more stars. They wouldn't even have to be the premier players, just guys who score more than five points (or less) per game. 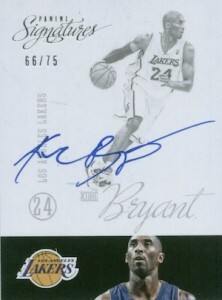 Despite not getting a great autograph, I like a lot of things in 2012-13 Panini Signatures Basketball. It has some distinct elements that aren't in other sets. This gives it a personality. But I think there's room to go further. Keep the variations, but make them wilder. Instead of using die-cuts to make somewhat non-distinct parallels, try these out as the Chase variants. That way, the artwork can stay the same and at first glance, cards won't look the same. Just don't bring back the Fractral Matrix system. Those stuck in 1997 are still trying to make sense of it. The big thing is the autograph names. There doesn't necessarily need to be more bigger names, just more of their signatures. With only five cards per box and three of them being autographs, the average box should yield at least one that's decent. 2012-13 JON LEUER PANINI SIGNATURES FILM GREEN AUTOGRAPH AUTO #1 5 EBAY 1 1? 10 cards with just a small interior picture changing. No thanks. Price per box is way too expensive. Set lacks variety and player selection. Auto’s are disappointing. Typical Panini garbage we’ve been seeing of late. 1 box, 1 pack over $150, for a few college kids signatures that won’t be in the NBA in a year or so. Just like always, Poo-nini fails to deliver even the slightest bit of value and excitment. 4 cards, 3 autos, 4 scrubs. Every box Ive seen busted was crap and mine was the same. Its sick what this company does to this wonderful hobby! I guess I’ve been one of the luckier ones. Purchased 4 boxes recently as price one them had plummeted to $69 due to lack of interest I assume. Pulled a rodman film /3, bird film /5 and a Yao Ming chase 1/1. Although I have purchased a couple prior to these and had no luck, so I get what these other guys are saying about the numerous parallel autos of scrubs. Over all I was happy with the outcome. There are good player autos but much more bad player autos.